The National Bank of Ethiopia (NBE) has introduced one birr coins in a bid to replace birr notes that are relatively costly to produce due to their short life cycle. Until last week, the fifty cents coin was the highest value coin in circulation in Ethiopia. The new one birr coin becomes the highest denomination coin in circulation and exacts the value of the one birr note. NBE vice Governor, Getahun Nana said the one birr coin will begin circulation at the dawn of the Ethiopian New Year, which begins on the 11th of September, 2010. According to Getahun, the introduction of the new coin comes after a study concluded that the cost of printing and circulation of the one birr note to the national treasury was more than its value. Whilst the government spends 16 cents to print a single birr note, the average life cycle of a birr note is limited to only one and a half years. “Now the new coin, which costs us 77 cents each to mint, can last up to forty years without any more costs,” Getahun said. 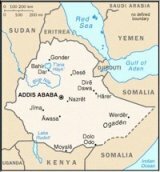 The average life cycle of coins in Ethiopia is between 25 and forty years. According to the NBE, 411.6 million coins have been minted and are ready to go into circulation from the first day of the coming new Ethiopian year. The operation is believed to have cost the bank close to 274 million birr. But Getahun believes that the cost involved in minting new coins and retrieving the old notes is an investment from which the country stands to gain. The one birr coins are expected to last at least three decades as against the average 18 months life cycle of a one birr note.